As one of the largest established banks in Singapore, the OCBC Bank is recognised for its financial strength and stability, leading with its strong presence in Southeast Asia. Not forgetting its roots, the conglomerate gives back to society through many socially responsible programs and charitable initiatives. In addition, it has provided talented individuals an opportunity to further their studies with the OCBC Local Undergraduate Scholarship. Over 800 bond-free scholarships have been awarded to outstanding undergraduates, giving them the lift they need to soar higher. OCBC scholar Nadine Ng talk to us about how the OCBC Local Undergraduate Scholarship has helped her to achieve her dreams. 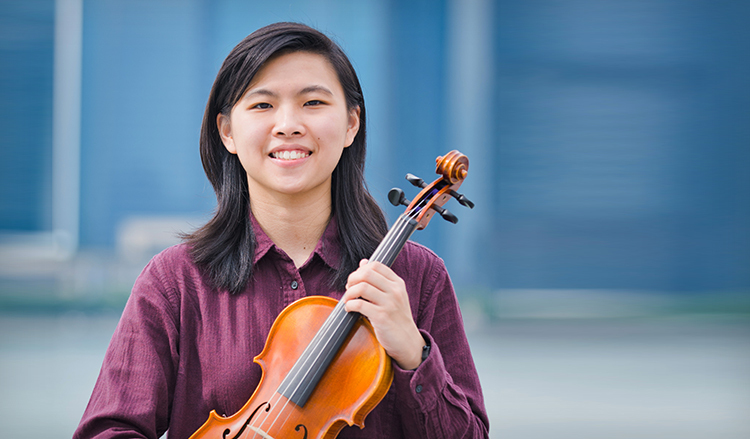 With OCBC scholarships, how did you feel your passion and talent could be fulfilled and developed? Nadine: The OCBC scholarship has helped ease the financial burden on my family and given me the opportunity to take up an unorthodox bachelor’s degree at Nanyang Academy of Fine Arts. This allows me to hone my talent in music and pursue my passion fearlessly. What are some great opportunities you have experienced with the scholarship so far? Nadine: With [email protected], a warm family of current and alumni scholars, I was able to be part of the organising committee of the 2017 OCBC Scholarship Ceremony. The opportunity to work with scholars from diverse backgrounds gave me different perspectives on handling an organisational project, and the experience was truly refreshing! How will these be beneficial to your personal and professional growth? Nadine: The bonds that were forged during such events allowed us to make connections and it helped broadened my network. As a performing and teaching musician, networking is essential for me to reach out to a wider audience and work with potential partners. Through these exchanges, the benefits were numerous – I got to enhance skills in creativity and team management, as well as learning more about my strengths and weaknesses. What are some programmes in place at OCBC to facilitate scholars into their careers at OCBC after graduation? Nadine: OCBC offers internship opportunities which can lead to employment possibilities after graduation, based on merit. Although OCBC’s internship programmes are not applicable to my field of study, Nanyang Academy of Fine Arts’ OCBC Scholars are often presented with engagement opportunities for their corporate events. Why would you advise aspiring scholars to partner with OCBC for their future? Nadine: OCBC cares for the future generation of Singaporeans. Partnering with OCBC ensures that you are in a helpful and supportive environment that will offer you many opportunities to engage actively in our community as an undergraduate and future contributor.